Lieutenant General Roberto Perretti joined the Military Academy in 1978. Regimental duty ranges from platoon leader (10th Bersaglieri) to Company Commander (10th Bersaglieri – 6th Bersaglieri), Battalion Commander (6th Bersaglieri), Regiment Commander (8th Bersaglieri) and Brigade Commander (Aosta Brigade). As Staff Officer he served as S2/S3/G3/G5/G7 at Battalion, Corps and Army level. Military education includes Staff Course, Army War College, Joint War College. From 12th April 2012 was appointed as Chief of Operations, Training and Intelligence Department of the Italian Army General Staff. 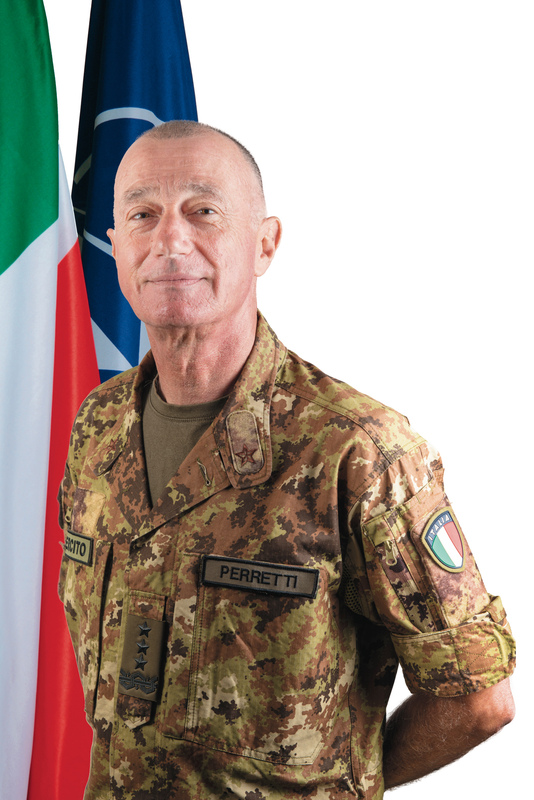 Lieutenant General Perretti served in operations in Lebanon, Albania, Iraq, Afghanistan and Kosovo. He assumed command of the NATO Rapid Deployable Corps – Italy on 30 September 2016. Lieutenant General Perretti is married to Mrs. Maria Agnese and they have two children. Interests include many sports, motorbikes and modern history.